For applications that require Dante or AES67 networked audio, the Crown DriveCore Install DA Series provides a balanced combination of output power, channel count and speaker load flexibility along with proprietary DriveCore technology for superb efficiency and exemplary audio quality. The DCi DA Series includes a high-powered DSP with JBL speaker tunings, network control/monitoring, and the ability to drive 2/4/8/16 ohm, 70V and 100V speaker loads. The amp’s advanced capabilities and support for Dante Domain Manager makes it perfect for installations that have standardized on Dante for networked audio transport. Simplifies installation by enabling Dante / AES67 networked audio signals to be sent directly to the amplifier. 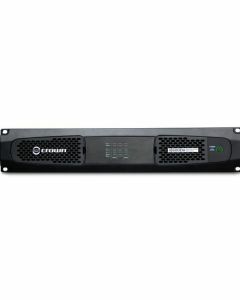 Provides flexibility of installation options available with our expansive line-up of DriveCore Install amplifiers. Includes support for Dante 4.0 firmware for integration with Dante Domain Manager. Better monitoring, control and audio manipulation with the HiQnet protocol over standard TCP/IP network. The HiQnet Audio Architect software allows for remote configuration, monitoring, and control of all aspects of the DCi-DA Series amplifiers. GPIO ports can be configured in many different ways, such as volume controls, recall presets, or to report errors to third-party control system.